Statistically, every other fridge in our country is decorated with magnets representing world landmarks — the Eiffel Tower, the Taj Mahal, the Colosseum, Neuschwanstein castle, the Empire State building — even if the fridge’s owner has never left his neighborhood. But now you don’t need a refrigerator to visit famous tourist landmarks! In this edition of board game Comparity, a hundred world-famous buildings, monuments, cathedrals, and even bridges are waiting for you to sort them by height and date of construction. 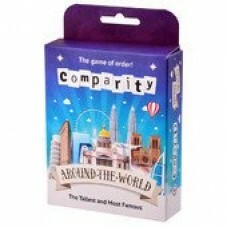 Comparity is a series of fast-paced, compact board games in which you compare everything in the world, from the heights of famous buildings to the box offices of classic movies. 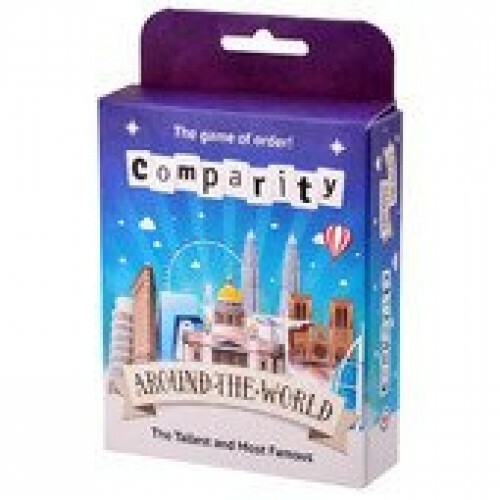 Always keep an eye out for new Comparity games in stores! Players take turns in clockwise order, starting with the first player. During your turn, you can either play one of your cards into the play area, or check any of the face-down cards in the play area. Next your turn goes to the next player, your neighbor on the left. The person who gets rid of all his cards first wins. For the sake of simplicity, let’s call the cards lying face down in the game area “closed cards” and the cards lying face up “open cards.” “Opening a card” means turning it face up. Two cards that touch at the edges (whether horizontal or vertical edges) are called “adjacent cards.” If cards touch only at the corners (diagonally), they are not considered adjacent cards. The first player to play their last card to the play area immediately wins. As you play this game, you will end up seeing many of the cards’ faces and are likely to remember the dates and heights for those particular buildings. Your next game will be more fun if you exclude the cards you are already familiar with. If at the end of the game there are still cards that have not been revealed, do not turn them over. Instead, shuffle them in with the unused cards and use this deck of unused cards the next time you play. Set all the cards that were used in the game aside. Do not return them to the deck until there are no more cards left that have never been revealed in a game. Producers: Timofey Bokarev, Dmitry Kibkalo. Contributors: Konstantin Seleznev, Ivan Karmanov, Aleksey Reznikov, Natalia Bokareva, Tikhon Fiseysky, Petr Tyulenev. Artist and Graphic Designer: Andrey Shestakov.